While this issue doesn’t really delve into the fate of the missing heroes, as Matt Kindt’s Justice League of America #8 did last week (review), we get to see an exploration of Ultraman here, something that provides a nice counterpoint to the overall story that is developing in the Forever Evil event main-comic, also being written by Geoff. And we don’t see Ultraman as he is right now, we see his origin story, how he escaped Krypton as a baby, how he was found by the Kents, and then how he met some of his fellow members of the Crime Syndicate. And that’s why I enjoyed this issue so much. It gives some really good background material on Ultraman. The third parallel universe, of which Earth 3 is a part of, is the birthplace of evil supposedly and this issue does a good job of showcasing that. Ultraman’s father, Jor-Il is a pretty heartless man, and so is his wife, Lara. Even the Kents aren’t immune to that. Each page shows how dark this parallel universe is, and how it has shaped and refined Ultraman as a tyrant, as a villain. 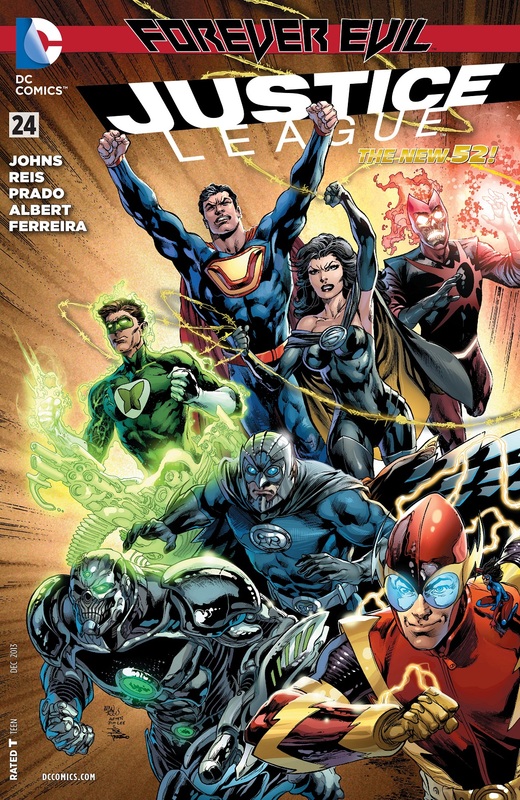 Geoff Johns takes all of that, and brings it forward to Earth One, where he moves the story forward by showing us glimpses of how the Crime Syndicate is dealing with the world’s heroes and villains alike. Any one who opposes the new world order is put down ruthlessly and each member of the Crime Syndicate has his or her own way of dealing with them. But that’s not all. This issue has a very epic confrontation between Ultraman and Jimmy Olsen. Ultraman has had certain… run-ins with Jimmy Olsen of Earth 3 it sees and before he deals with the Kahndaqi military he goes off on a tangent to the offices of the Daily Planet to see what kind of a man Jimmy Olsen of Earth One is. And he is not… amused, not by any means. The issue ends with a pretty epic confrontation between Ultraman and another superpowered character, someone we last saw in Villain’s Month. Its very much a coming back full-circle for this character since he had a fairly long run in the New 52 Justice League and was seen as a premier character in Justice League #21. This was somewhat of an unexpected confrontation, and I’m really thrilled that Geoff worked that in. There is a lot of stuff that is packed into this issue and we get an overview of a lot of different things as they are happening in the DC universe right now, even though some things are still a secret, such as the identity of the… prisoner that the Crime Syndicate brought with them to Earth One. But, we do know one major thing for sure now: just why the Crime Syndicate is here, and who forced them to make that decision. There is something for everyone here, and Geoff tells a really great well-paced exciting story. Ivan Reis is the penciller here, with Rod Reis on colours, Nick J. Napolitano on letters, and Joe Prado, Oclair Albert, and Eber Ferreira on the inks. This creative team is the same one as we saw on Justice League #23 and some of the other preceding issues, so its great to see that there’s the consistency and continuity because these are all great artists and they really make this issue a great one. Justice League has been one of my favourite series in the New 52, and this issue continues that trend. Reading through this issue, its clear that all the artists are really into these characters, because they let everyone pop off the page. The colours are dark and help portray the darkness of both Earth 3 and the Forever Evil storyline on Earth One. Its all a hand-in-glove situation and the fit is perfect. Justice League has had a great run in the New 52 and despite the fact that the Villain’s Month issues for all the JL titles were all mostly duds, the regular titles are coming back with a lot of energy and punch and with some great ideas. That’s the kind of stuff I want to see. Posted on October 24, 2013, in Comics Reviews, Review Central and tagged Black Adam, Comics, Comics Reviews, Eber Ferreira, Forever Evil, Geoff Johns, Ivan Reis, Joe Prado, Justice League, New 52, Oclair Albert, Review, Review Central, Rod Reis, Superheroes, Supervillains, Trinity War, Ultraman. Bookmark the permalink. 9 Comments.